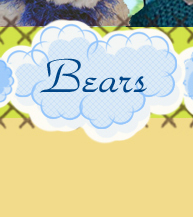 Welcome to the archive page of Barrister Bears. 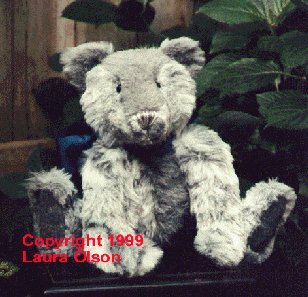 Here you will find photos and descriptions of previously adopted bears and special orders. Some of these bears are unique while others show different fur choices and color schemes for costumes. 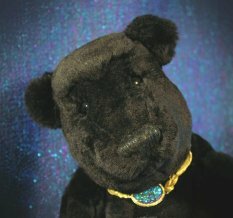 Hopefully these bears will help you see the wide variety of possibilities so that you can order a truly special bear. Please feel free to e-mail me if you have any further questions. 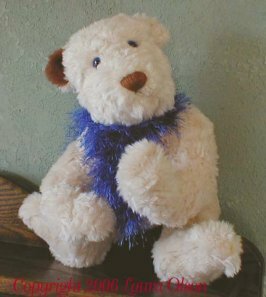 Blue is a gleeful little 16" ted made from imported extra dense curly synthetic fur the color of creamy swirls. And his german glass eyes are great deep pools of azure that you could just get lost in. He wears a hand-knitted scarf of sapphire blue that matches his darling eyes. He's so dreamy! 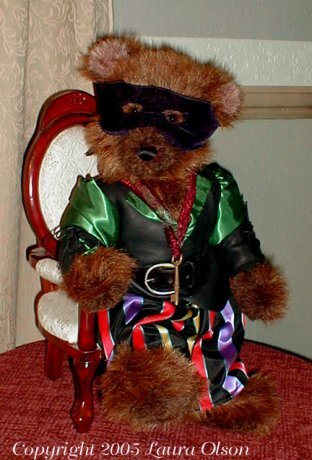 As with all Barrister Bears©, he is fully jointed, stuffed with polyfil and has a handstitched nose. Timothy is made from two colors of imported synthetic fur. An antique large blue ribbon bow compliments his solid gray and gray/white blend. A classic ted for that special home. Bandit is a 20" bent-leg bear made for sitting. He is crafted from long-haired, imported synthetic fur in a scruffy amber brown color. His muzzle is slightly shaved to create his serious expression. His paw pads are shaved fur so as to leave no paw prints behind. 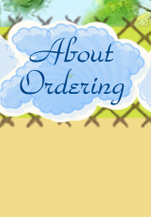 His outfit is of black satin pants with multi-colored stripes. His shirt is that romantic, pirate style of a blousy green fabric and his vest is made from black leather and smells great! He wears a black belt with a big silver buckle. His most important feature is his black velvet mask to hide his secret identity. Bandit has always been well behaved and understanding even though he is a rough, tough pirate. He does have a problem with stealing my jewelry however! What a cute little high-kicking saloon bear she is! Trini is a 20" tall ted of imported white synthetic fur. She has special jointed knees for kicking the "Can-Can". 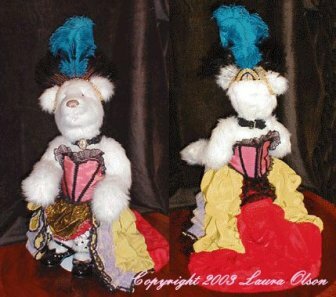 She also features Barrister Bears' new "Paws Down" bent arm design and a smiling open mouth of pink velvet. Her bright outfit includes a dress with a hot pink bodice trimmed in black, a red and yellow taffeta draped skirt and train accented in purple lace and red fringe. She wears her mother's heirloom lace collar necklace and bloomers of white satin with brown polka-dots. Her accessories include black patent dress shoes and a gold sparkly headdress with black and blue feathers. This 16" Victorian beauty is ready for the yacht club trip around the world. 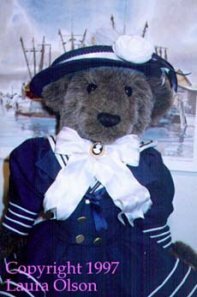 She is attired in a 1895 vintage dress and hat. 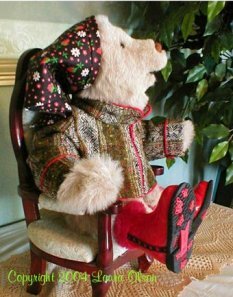 Gretchen is styled in a trendy "Euro" look of cotton head scarf, jacket or sweater, and clogs or booties. This Gretchen is made from a super-soft imported synthetic fur in a blend of pale carmel and creme. She is wearing a zip-up jacket made of antique peruvian woven wool/cotton with red trim and cute shiny red patent booties that zip up. 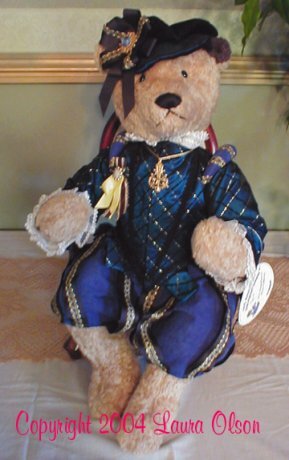 Shakesbeare is the author of many famous bear tales and epic tragedies from the Renaissance period. He is dressed in authentic slops, and doublet with shoulder rolls, neck and wrist ruffs, and tasseled flat cap. Imported curly synthetic fur. 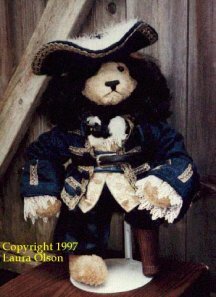 Blackbeard July/August,1998 - Bearworld Bear of The Month! These teds are collectibles and not intended for children. All our artist bears will be sent gift boxed with their Bear Certificates as a symbol of their uniqueness and the long hours and care taken to lovingly create them.